Just-in-time consumption: Does the `pint of milk test’ hold water? Cross-posted from streets.mn: Just-in-time consumption: Does the `pint of milk test’ hold water? Today, the vast majority of those goods are not acquired at home but in stores or online. Delivery services have replaced salesmen, as the two functions (delivery and sales) are now distinct and specialized. Today’s visitors might be the post office, FedEx or UPS, and the pizza delivery boy. Just-in-time does not require delivery to the residence, it can involve ubiquity in the placement of stores, so that they are near the end consumer. Traditionally the retail store was just that, a place where a community could store goods, and individuals could take or buy them as needed. A new model of temporary lockers may emerge to fill the gap. Many planners would like to make the ability to acquire goods just-in-time without the use of a vehicle a normative planning standard. For instance, a report, Beyond 2010: A Holistic Approach to Road Safety in Great Britain calls for the “pint of milk test”, for all new developments, whereby a resident can get to a shop to buy a pint of milk in 10 minutes or less without getting in their car [Parliamentary Advisory Council on Transport Safety, 2007]. The idea of 10 minutes comes from people’s willingness to walk, people are less willing to walk longer distances than shorter, and 10 minutes (or one-half mile (0.8 km)) seems to be a threshold over which walking tolerance seems to drop. This distance was derived from several empirical studies, including Pushkarev and Zupan [n.d.], who showed the median walk by travelers accessing the New York subway was 0.35 mi (0.57 km), while the median walk to access commuter rail stations in suburban New Jersey was 0.5 to 0.6 mi (0.8 – 1.0 km). Results from the 1983/84 National Personal Transportation Survey reported by Unterman  found shorter distances: 70 percent of Americans will walk 500 feet (0.15 km) for normal daily trips, 40 percent walk 1,000 feet (0.31 km), and only 10 percent walk a half-mile (0.8 km).The pint of milk refers to a standard quantity of a highly perishable and frequently consumed good. The objective of avoiding car use is obvious for a group advocating road safety. The pint of milk test has received some currency in England, being noted by several studies in recent years [Bennett and Morris, 2006, Marsh, 2004]. This is a particular issue in a crowded city like London, where auto ownership is lower than suburban areas, roads are more crowded, and parking more difficult even for those with a car. The trends in retailing have been clear in the United States for a long time. Stores are over the long term getting larger and gaining larger market areas [Yim, 1990]. Small stores serving local areas have been losing market share to larger stores which bring with them economies of scale. Efforts to reverse this trend have met with resistance from retailers, consumers, and neighbors [Nelson and Niles, 1999]. Illustrating this trend, the Food Marketing Institute reports in 2011 there were 36,569 supermarkets (with $2 million in sales or more, noting the median annual sales for a supermarket was $17 million, and average size was 46,000 sq. ft. (slightly down form a 2005 peak of 48,058, indicating an increasing number of smaller markets in recent years, but nowhere near retracing the long march upward). The average number of trips per week consumers make to the supermarket was up to 2.2. (from 1.9 in 2006). As with stores, houses too are getting larger over the long run. New suburban homes have more space to store goods in-house. While urban residents export storage to common stores, suburban residents more likely to have second freezers, have more space to store stuff. While the number of freezers per household in the United States is declining as second freezers are being retired and not replaced, the number of refrigerators is increasing slightly, due to households obtaining second refrigerators. [Wenzel et al., 1997]. While no immediate inference can be made about this, other trends are also at work. Total refrigerated and frozen space has not been computed, though the average size of a house’s primary refrigerator or freezer is likely increasing. Food may last longer in refrigerators than it used to due to the addition of preservatives (though the trend of increased consumption of organic foods may reverse this). Further globalization may mean that fewer goods are seasonal and need to be accumulated prior to their being out-of-season. Persson and Bratt  note that e-shopping may induce the installation of a second set of fridge/freezers per household to receive delivered goods. This additional electricity consumption has environmental consequences; already, there are 2.2 refrigerators and freezers per household in New Zealand (Roke, 2006) cited in [New Zealand Ministry for the Environment, n.d.]. If urban residents do undertake more just-in-time consumption than suburbanites both because of the higher storage costs associated with smaller houses, and the greater opportunity afforded by more stores nearby, we would expect to see this show up in the travel behavior data that is collected by urban regions. 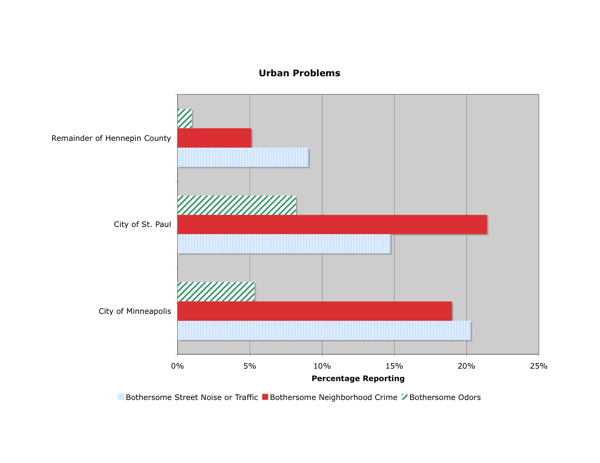 Table 1 illustrates some of the differences between the City of Minneapolis, suburban Hennepin County (Hennepin excluding the City of Minneapolis), and the City of St. Paul in neighboring Ramsey County. Residents of Minneapolis live in older houses (average year built of 1926 vs. 1970 in the suburbs) with 1773 square feet vs. 2152 in the suburbs. However because of the lower household size, city residents actually have slightly more area per person. 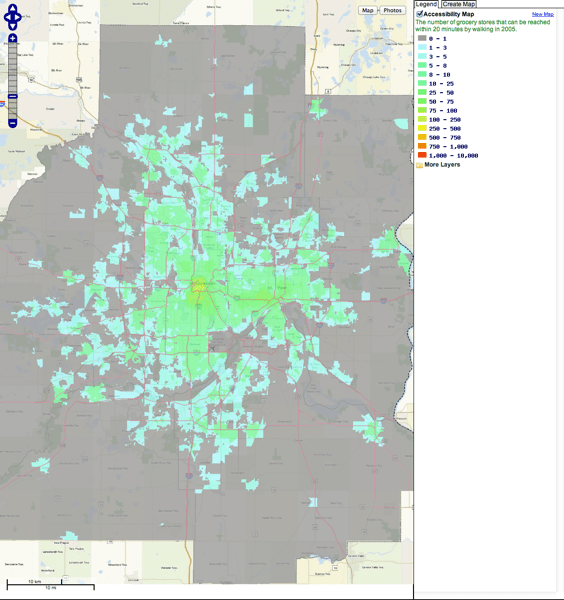 Further Minneapolis residents are more likely to be carless. According to the 2000/2001 Twin Cities Travel Behavior Inventory among residents of the City of Minneapolis, 12.8 percent of daily trips were for shopping 5 while for Hennepin County excluding the City of Minneapolis the number was 12.2 percent. Thus Minneapolitans devote 5 percent more of their trips to shopping than suburban Hennepin County residents. Minneapolitans also make slightly more trips than their suburban brethren, 3.81 per day vs. 3.70 for suburban Hennepin. (The unpublished 2011 TBI will likely show significantly lower numbers here). Given the small differences and their temporal instability, it probably is unreasonable to make much of them. The evidence supports the hypothesis that city residents who have somewhat higher accessibility (see Figure) to neighborhood stores and somewhat reduced storage space at home shop more frequently. Broadly, there are two types of places, those that satisfy the pint of milk test, and those that don’t. Similarly, there are two kinds of people, those who care about the pint of milk test and those who don’t. The problem comes from the mismatch of those who care but live in places that are unsatisfactory. (Those who don’t care but live in places passing the test are probably okay). If self-selection is at work, these cells are not randomly distributed, but people who want to live in particular environments do so. People who prefer milk-accessible areas bid up prices in those areas, while those who are indifferent (or perhaps lactose-intolerant) move out. However, if preferences change faster than spatial structure, there may be a mismatch. Policy that excludes mixture of residential and commercial development may also foster a mismatch. Evidence from the Twin Cities bears on the issue (Figures 2 to 5). 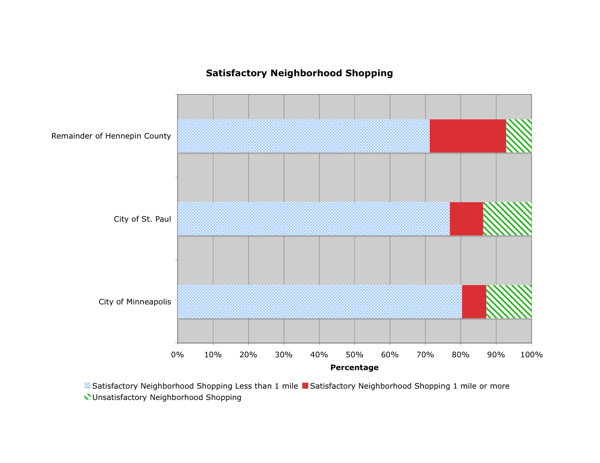 According to the American Housing Survey [US Census Bureau, n.d.], over 80 percent of residents in the City of Minneapolis report satisfactory neighborhood shopping within a mile of home, compared with 70 percent of those in suburban Hennepin County (Figure 2). 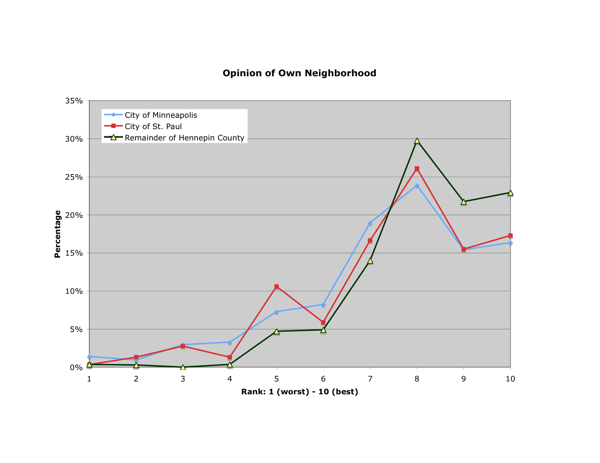 Despite that positive assessment of shopping, suburban Hennepin residents have a better opinion of their own neighborhood than those in the City of Minneapolis (Figure 3). The problems these urbanites report in greater numbers than their suburban counterparts are noise and traffic, crime, and odors (Figure 4). 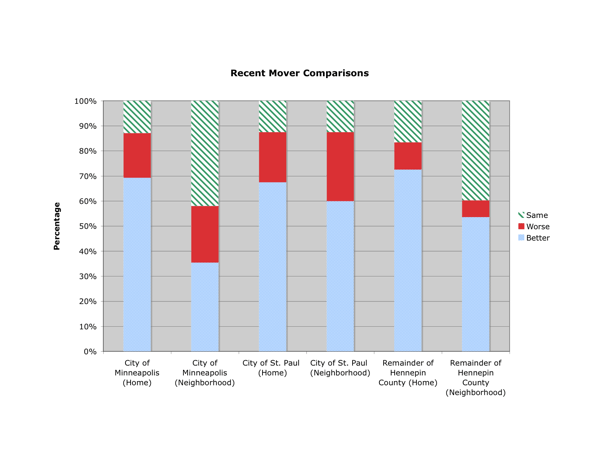 When people move, they are doing so to places they believe are better, but for all residents it is the home that is better than previous much more so than the neighborhood, and in Minneapolis, only a third rate their current neighborhood as better than their previous (in contrast to half of suburban residents) (Figure 5). To the extent neighborhood shopping enabling just-in-time consumption of the pint of milk is important to people, cities fare better than their suburbs, but if the cost of that neighborhood shopping is other urban ills, people will make the trade-off, sacrificing access to retail to have access to quiet and congestion free, safe, and pleasantly smelling suburban environments. Whether this is a social good is another question entirely, and depends on relative efficiency of urban goods delivery services, energy efficiency of in-store displays vs. at-home refrigeration units, and numerous other questions. Bennett, J. Morris, J. 2006 , Gateway people, Technical report, Institute for Public Policy Research. Foxell, C. 2005 , Rails to Metro-Land., Clive Foxell, Chesham, Bucks, England. Handy, S. 1993 , “A Cycle of Dependence: Automobiles, Accessibility, and the Evolution of the Transportation and Retail Hierarchies”, Berkeley Planning Journal , Vol. 8, pp. 21-43. Heiskanen, E. Jalas, M. 2000 , Dematerialization Through Services: A Review and Evaluation of the Debate, Ministry of Environment: Edita, jakaja. Herman, R., Ardekani, S. Ausubel, J. 1990 , “Dematerialization”, Technological Forecasting and Social Change , Vol. 38(3), pp. 333-347. Marsh, G. 2004 , “Tesco piles ‘em high: Flats above supermarkets are a good buy”, The Times , Vol. June 18, 2004. Nelson, D. Niles, J. 1999 , “Market Dynamics and Nonwork Travel Patterns; Obstacles to Transit-Oriented Development?”, Transportation Research Record , Vol. 1669, Transportation Research Board of the National Academies, pp. 13-21. New Zealand Ministry for the Environment n.d. , Technical report. Parliamentary Advisory Council on Transport Safety 2007 , Beyond 2010: A Holistic Approach to Road Safety in Great Britain, Technical report, Parliamentary Advisory Council on Transport Safety. Parliamentary Advisory Council for Transport Safety http://news.bbc.co.uk/1/hi/uk/7046200.stm. Persson, A. Bratt, M. 2001 , “Future CO 2 savings from on-line shopping jeopardised by bad planning”, Proceedings of the 2001 ECEEE Summer Study ÔFurther than Ever from Kyoto . Pushkarev, B. Zupan, J. n.d. , “Where Transit Works: Urban Densities for Public Transportation”, Urban Transportation: Perspectives and Prospects , pp. 341-344. The Rise and Decline of the Great Atlantic and Pacific Tea company n.d.
Unterman, D. 1990 , `Accommodating the Pedestrian: Adapting Towns and Neighborhoods for Walking and Bicycling. Personal Travel in the US, Vol. II: A Report of the Findings from 1983-1984 NPTS, Source Control Programs’. US Census Bureau n.d. , American Housing Survey for the Minneapolis St. Paul Metropolitan Area, Technical report, US Census Bureau. 1998AHS: Minneapolis h170-98-9. Wenzel, T., Koomey, J., Rosenquist, G., Sanchez, M. Hanford, J. 1997 , “Energy Data Sourcebook for the US Residential Sector”, Lawrence Berkeley National Laboratory, Report , Vol. 40297. Wernick, I., Herman, R., Govind, S. Ausubel, J. 1996 , “Materialization and Dematerialization: Measures and Trends.”, Daedalus , Vol. 125(3), American Academy of Arts and Sciences. Yim, Y. 1990 , The Relationship Between Transportation Services and Urban Activities: The Food Retail Distribution Case, PhD thesis, University of California, Institute of Transportation Studies. Adapted and updated from a post on The Transportationist Nov. 8 2007.